Did PM Erdogan and Saudi Arabia Coordinate With AQ Terrorist Groups? Almasdarnews had a story today on how Saudi Arabia and Turkey provided access to Turkish Drones in planning and coordinating attack on Idleb, Syria. If Turkey is allowing access to what one would assume are high end NATO drones via computer and smartphone uplink, just shows the level of support these groups are getting. It's no secret that both countries want Assad removed. Incredible how the only remaining secular government in the middle east, is under attack by governments essentially ruled by Islamic Clergy. Definitely not happy that my government (Harper Government of Canada) supported this measure. Methinks it would be a great idea for the middle east to be a Nuclear Free Zone and Israel has nukes, apparently lots of them. No wonder Iran/Saudi Arabia want to counter that. Saner heads should prevail. Read full article on Yahoo News. The Oryx Blog is an excellent source of information going on in the Levantine War and other foreign hotspots. He/She is so well informed that they must be an insider intelligence professional - not that I have any knowledge of the former. Just making an assumption. The blog's article on this assault on is impressive in it's detail. Methinks that perhaps the Syrian Arab Army, is being out generalled! Very disappointing how a so called professional army, can leave the spoils of war intact when retreating. One would think an officer or leading NCO would ensure that some thermal grenades were used on each piece of equipment before leaving, and any ammunition that can't be taken with them, destroyed. Not sure if these defenders were "elite" troops or not - I hope not! 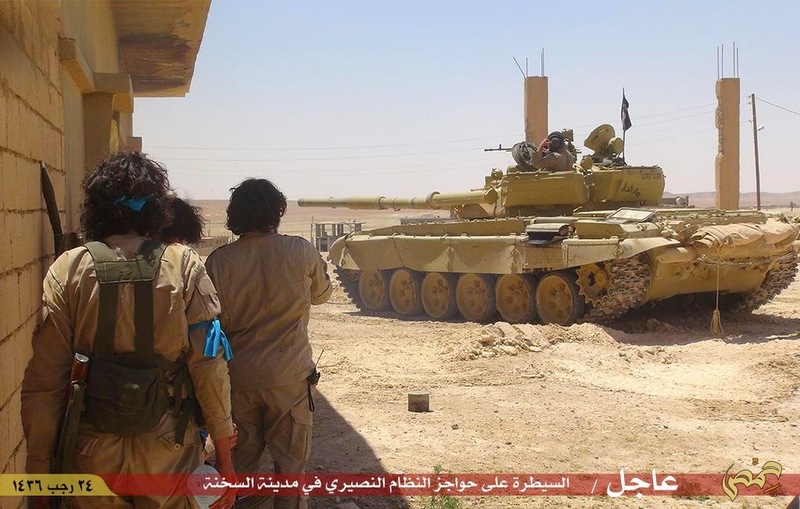 The article is here: "The Islamic State's spring offensive: al-Sukhna"
Islamic State [VIDEO] of Their Attack on SOKHNA, Syria. Islamic State produced video showing their attack on the Syrian desert outpost of #Sokhna. From what I've gathered from other sources, the Regime Forces are spread rather thin, and the regime wasn't expecting an attack at this location. It also seems that ISIS is starting to think in terms of Syria being a softer target, than IRAQ at the present time.